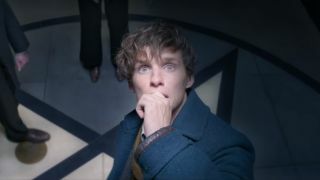 It's only been a month since we had our first proper look at Fantastic Beasts: The Crimes of Grindelwald (that's Fantastic Beasts 2 to those of us less well-versed in Harry Potter lore), but in the spirit of Christmas, we're revealing another exclusive new image from the upcoming sequel, brought to you via our sister publication, Total Film magazine. The photo in question shows returning magizoologist Newt Scamander (played once again by Eddie Redmayne) alongside trusted Muggle companion Jacob Kowalski (Dan Fogler), striding across the streets of what appears to be 1920s' Paris (check out the french language signage and bicycle baskets). It may be a single still, but this pic already throws up several questions about what we can expect from the movie, which has been penned by J.K. Rowling herself. What's in Jacob's basket? Why does Newt look so anxious? And what's brought them to the city of love? Given the title, I reckon another one of those pesky beasts has gotten loose. We don't know a great deal about the hush hush plot details for The Crimes of Grindelwald, but the big news so far is that Jude Law will be playing a young Dumbledore alongside Johnny Depp, who is expanding his cameo appearance from the first movie as titular dark wizard and antagonist, Gellert Grindelwald. As for the what, whys, and hows of it all, we'll probably have to wait for the first full trailer, but you can read more about Fantastic Beasts 2 in this month's issue of Total Film magazine, on sale December 22. In fact, if you subscribe to the smarter movie magazine right now, you can save up to 43% with My Favourite Magazine's latest Christmas sale. That's every new issue delivered straight to your door for less, with an exclusive subscriber's cover (below) that can't be found anywhere else. It's a no brainer!